How adorably clean and simple! Easy to reproduce, too! Very clever idea and what a cute card it made! Cute and good for the mass production cards. Thanks for sharing it. Lovely quick card to make! Thanks Marie! Love this idea! Thanks for the inspiration. Another example of an obvious idea that has never occurred to me! Love this idea Marie, thanks for sharing!!! Such a simple and easy to make card..
Love how CAS this is but so bright and festive! Great CAS card and easy to do too! Love this clean and crisp card! Love how you made this tree! Great card – and super quick too! Cute way to make your Chistmas tree! Love it! Darling card! Love that is so quick and easy! It would be a great design to make in multiples! What a super sweet card….in its simple and clean design. Great card! I love clean and simple with a punch and your use of the embossed background stamp cut into the tree really adds a punch. Really nice!! Adorable card. So easy and cute. I like how CAS this card is! 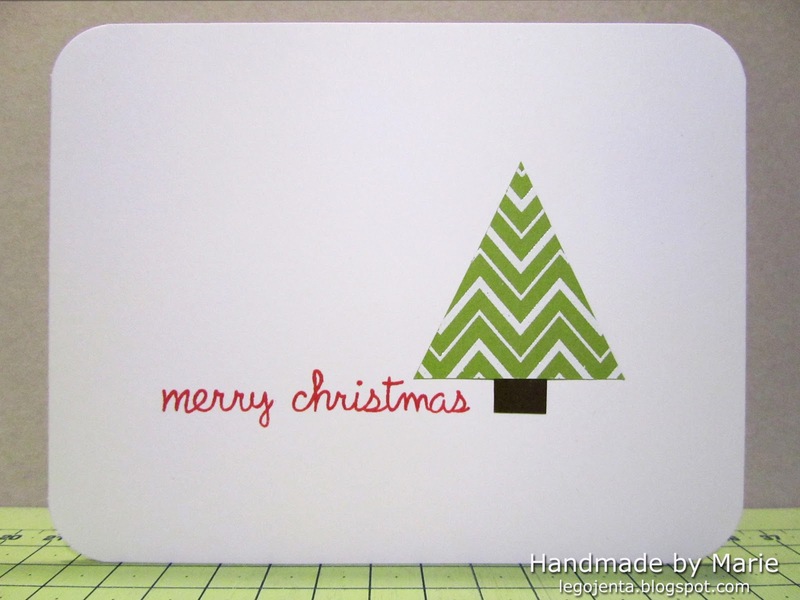 Awesome clean 'n simple card; love the look and the way you used the background stamp to make the tree. This opens up a ton of ideas for diff. occasions. I love your CAS & graphic style, Marie! Pretty, pretty, pretty…thank you for sharing. How quick and easy is that! Love it. Love the word stamps! I have to buy those! So impressed! Love the patterns on this pillow and can't believe your fabric stamping came out so clear. Looks awesome! Love this CAS card idea. Great way to embellish a die cut. Such a wonderful clean and simple card. Zig zag is perfect for a tree! Thanks for sharing! Gorgeous card Marie. Love it. Clean and simple! Love it! Like the Clean & Simple CAS style of this Christmas tree card. I love this clean card – love the idea of using the zig zag background stamp too. Love the cas design! Thanks! I love this idea! It's lovely and just right for my 6 yr. old granddaughter to do. Thanks for sharing! Such a graphically clean card! Love that little tree! What a great idea! I have several different stamps that might work. Thank you SO much for the inspiration. Great quick card but also very effective. And a great use for background stamps! Great, great clean and simple card! Such a wonderful use of the background stamp!! Clean and simple yet, beautiful! Great idea. This is adorable. Such a great and simple idea. Love it! Love this clean CAS card!